One of the ugliest vegetables known to man is celeriac AKA celery root. Big, hairy-like, knobby and ridiculously difficult to peel it’s actually a fun and delicious vegetable to serve during Pesach. Celeriac really is the root of the celery but there are specific varieties have been cultivated to produce really large root balls with smaller stalks. The ugly hides a very mild, delicious celery-ish flavor that acts like a potato when you cook it. When you pick up a celery root it should feel heavy for its size. The stalks at the top should be fresh, bright green and absolutely not slimy or wilted. Just know that Celery root are extremely difficult to peel because they are covered with roots and has lots and lots of nooks and crannies just waiting to defy your paring knife. Trust me when I tell you that no matter how hard you look you won’t find a smooth one so stop looking. You can get your Pesach on with the following super easy recipes and know that they’re great anytime of the year. Preheat the oven to 450. In a skillet saute the onions and garlic for about 2 minutes. Add the cream, milk, salt, pepper and nutmeg. Bring the mixture to a simmer, then remove from heat and set it aside to cool. Grease a 9 in. deep dish pie plate, spread one-third cup of the sour cream and then with a slight overlap, lay a layer of parsnips and then a layer of celery root. Spoon 3 tablespoons of the cream mixture over the two layers then repeat the process until you’ve used up all the celeriac and parsnip. Cover the top layer with parchment paper then cover that with aluminum foil (make sure the foil is really on tight). Bake for 45 minutes. Remove from the oven and let rest for 40 to 45 minutes. Reduce oven temperature to 375. Remove the foil and parchment, spread the remaining sour cream over the top and sprinkle the cheeses and matzo meal over the top. Bake, uncovered for 20 to 30 minutes until the top is browned. Let set for 3 to 5 minutes before serving. Serves 6 to 8. In a large skillet heat the oil then saute the celery root, sweet potatoes for about 2 minutes, then add the thyme, bay leaf, chicken broth. Mix to combine and cook, stirring occasionally until the vegetables start to soften and liquid is gone (about 15 to 20 minutes). Add the onion and garlic. Mix to combine; season with salt and black pepper and cook, scraping any browned on the bottom of the pan into the mix until the vegetables are soft about 25 to 30 more minutes. Remove the bay leaf, add the turkey pastrami or salami, mix to combine and serve topped with the green onions. Serves 4 to 6. In a stock pot salute the celery root, apples, and onion in the margarine. Over a low medium heat cook the apples and celery root for about 15 minutes (do not brown just soften), stirring occasionally for about 15 minutes. Add the broth bring the soup to a boil then reduce to a simmer. Cover and cook for 20 to 25 minutes. Remove from heat; cool slightly. Using an immersion blender or regular blender puree the soup. Return the soup to the heat, bring to a simmer and season with salt and pepper. Preheat oven 425. In a bowl combine the celeriac, potatoes and olive oil. Season with salt and pepper and add 4 sprigs of rosemary. Mix and then place them on a cookie sheet with sides. Cook for 25 to 30 minutes until the pieces are golden and fork tender. Just before the vegetables are done combine the honey, chopped rosemary and melted margarine in a bowl. Just before serving drizzle the mixture over the vegetables (in the pan). Mix to coat and serve. Serves 4 to 6. 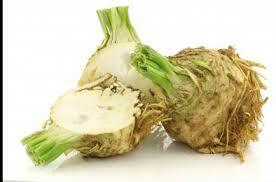 I love celeraic (celery root) I have been using it for decades.